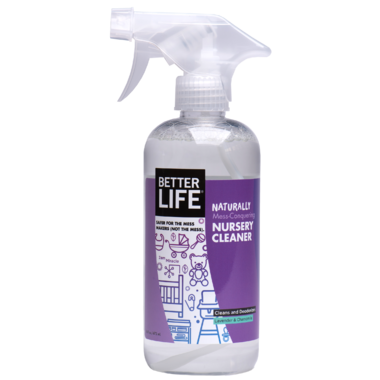 Better Life Nursery Cleaner is kind to little noses as it defeats and deodorizes “special” spots and smells. Make it your number one choice for number two catastrophes. Directions: Spray it on cribs, changing tables, toys, walls, mattresses, highchairs, strollers, car seats, and anything else your pint-sized mischief-maker might touch. Can also be used to pre-treat clothes, bibs, cloth diapers, and sheets. Spray and wipe. Go back to sleep. No rinsing required. To clean carpet, fabric, or upholstery, wipe up excess mess, spray onto icky spots, and blot with a towel.